Goodwill Wyoming is excited to share with you an opportunity to help your organization fund raising goals through Goodwill Donation Drives. 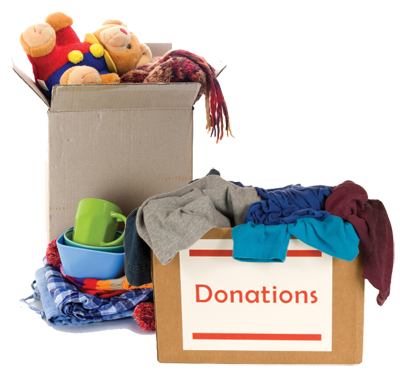 We offer the Donation Drive program to any organization looking to raise funds by simply collecting donations. Yes, it is just that easy! Read below about our program and if it is the right fit for you, then complete the request form and we can get started! When you host a Goodwill Wyoming Donation Drive not only are you helping your organization, you are giving back to the community! You collect donations which helps keeps items out of landfills and we create a second life for them. The sales from those items in our stores goes toward creating jobs and community programs right in your community! It is a win-win for everyone involved. Our typical host customers are schools, non-profit groups, student organizations, religious organizations, neighborhood associations, professional organizations, sororities/fraternities, clubs, any one looking to fund raise and even for profit companies! We suggest at least 4-6 weeks prior to your desired date to ensure you can secure your date and have enough time to be ready for it. What Will Our Organization Receive? We currently pay 5 cents per pound of donations collected. You are able to collect as much as you can in the Donation Drive time period. That can add up fast to a lot of cash for your organization. You also have little to no cost to you and you are looking at almost 100% profit. If you are a for-profit company, you are not eligible to receive payment for your donations collected, however, you will receive a letter stating the donation value collected for your records. You will also receive a Marketing Welcome Kit that will have electronic flyers, instructions, tips on how to be successful, etc. Where Do Donation Drives Take Place? Right now, Goodwill Wyoming is offering Donation Drives in Cheyenne, Laramie, Rock Springs, and Casper. As our fleet builds we will be able to offer them in more communities. If you are not in one of these communities and would like to participate, please fill out the request form and we will see if we can make it work for you! Your organization must have a location secured for where the Donation Drive will take place and secure the permissions necessary to have a truck on premises. You can not host it at one of our retail store locations. We will provide you with an agreement form establishing responsibilities, payment terms, rates, etc. You feel really great about raising money while giving back to the community at the same time! Once approved for the Donation Drive, you are required to watch the following 3 videos. This will take about 6 minutes total to watch them all.